Genki Gear Exclusive London Comic Con 2016 T-Shirt! 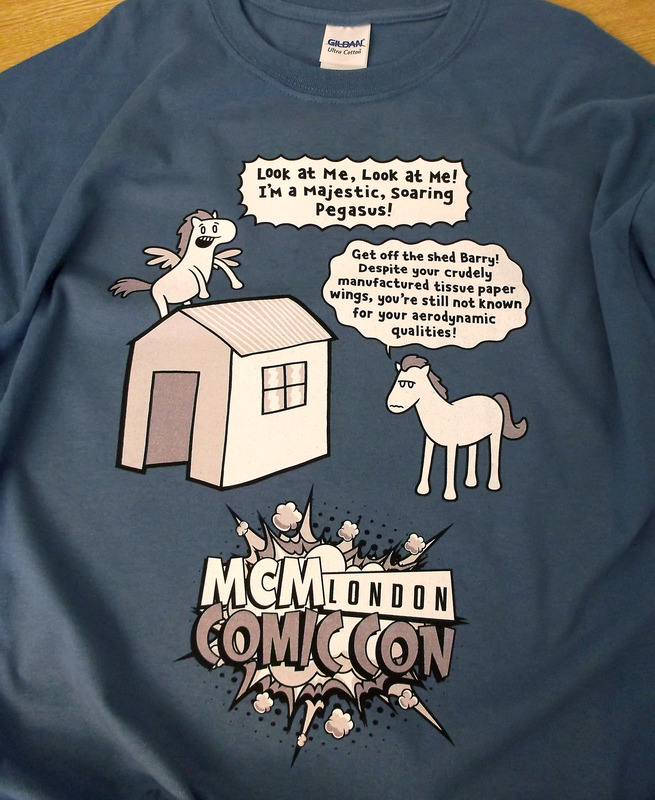 Posted on October 17, 2016 by thelostlighthouse	in Uncategorized and tagged Barry the Pegasus, Comic Con, Genki Gear, London Comic Con, MCM, MCM Comic 2016, MCM Comic Con, MCM London Comic Con T-shirt, The Lost Lighthouse, TLL. Check out Genki Gear’s official T-shirt for this month’s London Comic Con! Created exclusively for the MCM London Comic Con, the limited edition design will only be available on pre-order from 20th September to 23rd October. Available in both men’s and women’s sizes priced at £16.99, this great t-shirt showing the latest adventures of Barry in Barry the Pegasus T-shirts can be collected direct from the Genki Gear stall at London Comic Con itself, or you can have it posted directly to your home, ready to wear as soon as Comic Con opens. I’ve got a couple of t-shirts, a poster and a mug from Genki Gear, and not only are they very cool and funny, but they are all excellent quality too! To order your official MCM London Comic Con T-shirt and check out the rest of Genki Gear’s great range of geek-tastic clothing, visit www.genkigear.com. If you’re planning to collect your official tee at the show, you can also order it from the MCM store at www.mcmexpostore.com.